…as she’s shot through the leg, abdomen, chest, shoulders, AND head. Bloodbath races off seeking help, and a poor-condition Ghoul finds his teammate’s body. There was an ad already that referenced this issue, spoiling the fact that Tinsel DIES. I think the ad would have been better suited for after the issue, but then, it WAS the early 1990s, and deaths WERE a “thing,” where if some character (sometimes seemed virtually ANY character at all) died, suddenly that was a “key” issue. I didn’t specifically remember where the previous issue left off, so dropping straight into the action worked, but wasn’t ideal for this particular reading. But then, we don’t have to worry about any “wasted space” playing catch-up, and since this was published before the “recap page,” it would’ve needed space for exposition. The story is definitely advanced, with the Exiles team fumbling badly and pretty much failing to properly take down their opponent. They’re caught unprepared, and that costs them. Though by no means graphic or gratuitous, the page with Bloodbath and Tinsel was particularly disturbing, and I’d totally forgot about the aforementioned ad–I was rooting for her escape, and glad to see her get the start. That made it all the more discouraging to see her taken out, and so violently! Visually, everything looked as I’d expect, all the characters are quite familiar, even where I don’t remember names. As a third issue, it’s still early enough that for a team book, and from the ’90s with all of its tropes, I’m not surprised names haven’t stuck for me yet. Of course, in general it takes me a few issues to really get a hold on full group/cast names for something I’m not overly familiar with. Where the Rune stuff seemed choppy at first, jumping to vastly different time periods, here we continue in a linear sequence from the previous segment–again. This chapter, we find Rune in the desert, contemplating and then eating a skull with a bit of radiation from a bomb. He goes into a coma-like condition, and then finds some sort of coin or embossed logo of a lamp–Aladdin! He then takes off toward Scottsdale! As usual, we have consistent art, and it’s clear everything that’s happening with the chapter. On the story side, we do have another shift in narration/point of view, as we’re getting a running observation from someone watching Rune and reporting on what he’s doing. This certainly gives an interesting view, as no one knows what to make of him–who OR what he IS, and before they can even do anything, he’s off again. The narration reminded me a bit from the Death of Superman–where someone’s communicating remotely that Doomsday was just there and headed for Metropolis…too late for anyone to prevent the situation or even really do anything about it. 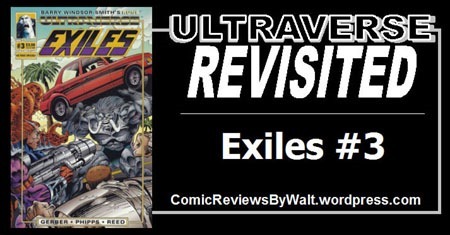 Exiles #3 is another issue that doesn’t really stand alone…I see no reason to seek it out in isolation from any other issues, unless it’s simply a lone missing issue being sought out to go with others in the series. 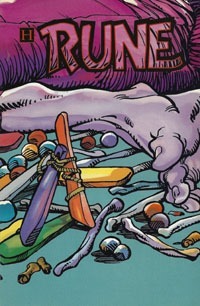 The Rune chapter sort of/kind of stands alone…for the narrator, it’s the first the creature’s been seen/observed, so if you’ve read none of the other chapters, you’re on equal footing, reading this. I vaguely remember at least reading ABOUT Tinsel’s death…but that was just as some random character I wasn’t familiar with, from a title I wasn’t really following. This time, reading the issue in its entirety (if I’d read it before, I don’t remember detail, and may have only skimmed it looking for something about Ghoul) Tinsel’s death carries a lot more weight, and I’m eager to get to the next issue and seeing (now with context of these first three issues) the other characters’ reactions to things. You could do a lot worse than this issue for 25 to 50 cents, but outside of getting several issues together, I would continue to counsel not going much above $1 or so to acquire this. Along with the first couple issues and the next issue, I remember there being some interesting stuff that’s leading into the first Ultraverse “event,” and it has me looking forward to getting there!